This weatherproof powder coated Stick Carrier fits the universal socket on the back of most scooters. It is supplied with an additional mounting bracket (including thumbwheel) to enable a choice of mounting positions. This weatherproof powder coated Stick Carrier fits the universal socket on the back of most scooters. It is supplied with an additional mounting bracket (including thumbwheel) to enable a choice of mounting positions. 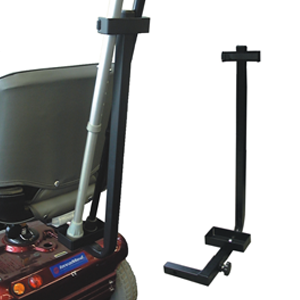 The carrier can be mounted centrally on the scooter, or by utilising the additional mounting bracket, it can be mounted at right angles to the mounting socket on the scooter allowing the stick carrier to be positioned at the left hand or right hand side of the scooter as preferred. Walking sticks or crutches are held in a self-draining retainer on the bottom and the top of the carrier has a captive bracket secured with a velcro strap for holding in place. It is supplied flat pack to eliminate any damage during transit and is secured with either the locking pin or hand wheel supplied with the scooter. It is suitable for carrying two walking sticks or crutches.